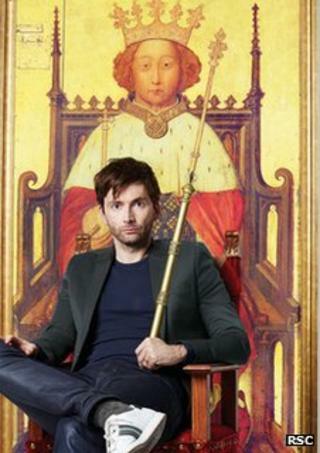 David Tennant is to star in the title role of Richard II as part of the Royal Shakespeare Company's new season. The actor is making a return to the RSC five years after his critically-acclaimed performance as Hamlet. It is the company's first season under artistic director Gregory Doran, who took over from Michael Boyd last year. Other highlights of the winter 2013 run include adaptations of Hilary Mantel's award-winning Thomas Cromwell novels, Wolf Hall and Bring up the Bodies. There will also be a world premiere of Ella Hickson's Wendy and Peter Pan, directed by Jonathan Munby. Richard II marks the start of a run of Shakespeare's history plays, each of which will be directed by Doran. Speaking at at Wednesday's season launch in London, Doran told the BBC he thought that Richard II could be "almost a bigger challenge" for Tennant than Hamlet. We will celebrate Shakespeare's life, from birth to grave, over an arc of three years, culminating in a major nationwide event in 2016. One of the triumphs of Tennant's Hamlet, he pointed out, had been his exploration of the humorous side of the role. "Richard II can seem like a paean of self-pity," Doran said. "I think David will find it quite hard that, for a lot of the play, the audience don't like this self-indulgent, self-obsessed creature that Richard seems to be." The production will run in Stratford-Upon-Avon's Royal Shakespeare Theatre in October and November, transferring to the Barbican Theatre in London in December. The RSC quit the Barbican arts complex in 2002, after 20 years in residence. Doran said he knew the return to the Barbican would cause "endless speculation" but said there had been no talks about a permanent return. Since leaving the Barbican, the RSC has not had a permanent home in London. It has used other venues, including The Roundhouse, while its hit musical Matilda has been at Covent Garden's Cambridge Theatre for more than a year. "We are a national company and it is absolutely vital that we are seen in the nation's capital," Doran said. He added that a variety of options - "some very surprising" - were up for discussion. "An automatic move back to the Barbican without exploring the reality of a theatre that can accommodate all our work is not something that I would contemplate immediately." He recalled that his predecessor Michael Boyd had made a guarantee that the RSC would be turning the keys to its new London home in 2016. "I can't make that guarantee, but I can say it's a very good ambition." The double-bill of Mantel's Wolf Hall and Bring up the Bodies premieres in the Swan Theatre, with the two works playing in repertoire from December to March. Doran revealed that Mantel devotees can look forward to some surprises. "Hilary has said there are bits she left out of the novels that she has would like to put into the stage versions." He went on: "It is a project which is peculiarly right for the the RSC to do. The first Shakespeare play I directed at Stratford was Henry VIII, so it's rather wonderful to be coming back to that same material but with an entirely modern take on it." He confirmed that he had someone in mind to play Thomas Cromwell. "I would love to tell you but I can't just yet." Mantel received the Man Booker Prize for each novel - the first woman to win the award twice - and, earlier this month, the author told the BBC she was looking forward to Mike Poulton's stage adaptations. "It's exciting particularly to have a stage version because I love the theatre. I suppose one of the things I regret is that I've never tried writing a stage play," she said. Mantel is currently writing the third instalment of the Cromwell trilogy. Doran sees the RSC winter season as a "prologue" to a wider plan, stretching forward over the next five years. "I hope we will work through the entire canon, producing all his plays in our new Royal Shakespeare Theatre, but without repeating the titles in that time. "2014 is Shakespeare's 450th birthday and 2016 marks the quarter-centenary of his death in 1616. We will celebrate Shakespeare's life, from birth to grave, over an arc of three years, culminating in a major nationwide event in 2016."